Having a selfie stick can help you to capture the best moments of your life in a frame as a perfect selfie photograph or group photo with your friends and family. If you’re getting ready to go for a tour anywhere or to participate at a party with your friends, you should have got a selfie stick to keep those memories in frames forever. 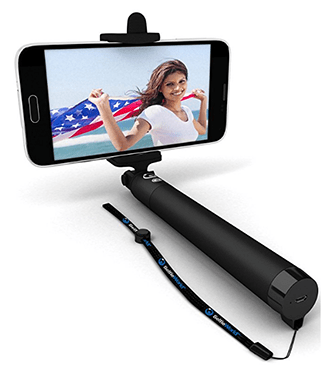 There are different types of selfie sticks in the market with stunning qualities and features. Some of them are the simple batteryless monopod, some of them are with Bluetooth remote, and some of them are with both features Bluetooth and Tripod. 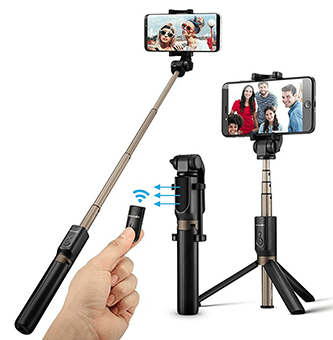 And, here I’ve curated the best Bluetooth Selfie sticks, which are perfect in quality and features, easy to use and top rated. Just pick your favorite one from the list and let’s start capturing the moments you don’t wanna forget. The Mpow iSnap X is the selfie stick that comes with the combination of quality, popularity based on its usability. Moreover, one of the cheapest selfie stick with Bluetooth compatibility, the 7.1” length is storage-friendly for your backpack or bag, your suitcase or even your jeans pocket. With a built-in Bluetooth remote, it allows users to take a selfie photo or group photos very easily every time with a better photo sight. Simply turn it on, then pair it with Smartphone via Bluetooth and then Snap. In total 31.5 inches long when fully extended, that’s more than long enough to capture the perfect shot for anywhere at any demand. Along with that, the included wrist strap adds a little extra security and safety when fully extended, and 270-degree adjustable head ensure you to find a best & beautiful angle when selfie photographing. With 4.7+ (out of 5) positive ratings and reviews Mpow is the No. 1 best seller in the Selfie Stick Monopods category. 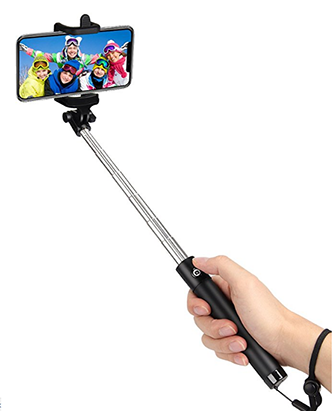 Our second pick is Kungfuren KS36 selfie stick that extremely affordable and offers 50-hours battery life (rechargeable), a reasonable adjustment process for its extension, and a universal phone holder for all types of Smartphone users. It’s also one of the most compact models on this list and you can fit it easily into your bag. Naturally, the stick is only 11 inches but the extended length is 31.8 inches that pretty much enough to capture the best selfie moments. Short lengths are suitable for more intimate shots while longer ones work best for fitting the whole scenery. Also, the adjustable head up to 270 degrees for obtaining the best angle when taking photos. Just turn it on and do the Bluetooth pairing with your compatible smartphone and get ready to take more professional-looking selfies. If you want a selfie stick with good battery life, good quality, and Bluetooth, the KS36 model from Kungfuren is still a great choice. If you want something extra attachments like a tripod and Bluetooth along with your favorites selfie stick, the Yoozon selfie stick could be an affordable solution without any doubt. It has a wireless remote whereas the maximum range of 10 meters, compatible with most smartphones. Besides that, this stick is lightweight for being made out of aluminum alloy, and also foldable, extendable up to 28.7 inches and can be twisted up to a 360-degree rotation to meet various photo or video needs. Before using it, the only step that’s needed to unfold the bottom part of the whole unit (the easiest and fastest way). Then, slide the Bluetooth remote from the stick and make sure it’s placed near the ‘Yoozon’ logo part. Then you’re ready to capture the evergreen selfie or group photos. Overall, Yoozon a fantastic piece of Bluetooth Selfie Stick with Tripod that you can buy for yourself or as a gift for someone. 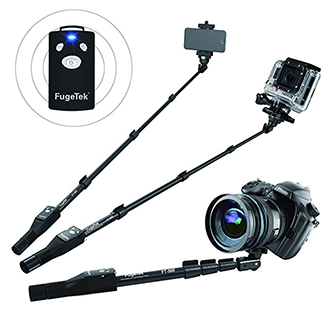 The Fugetek FT-568 is a universal Bluetooth selfie stick monopod which is as durable as user-friendly. It comes with a tough aluminum frame and non-slip grip rubber handle, compatible with all Smartphones, GoPro, and digital cameras. In addition to that, it’s completely waterproof that ensures perfect selfie moment always, no matter whatever the weather is. Also, features two interchangeable phone mounts that are extendable up to 4.2”, can be easily fitted with all large smartphones without the worry of slippages and sudden drops. The complete extended length is up to 49” that’s huge compared to others, even equipped with a mirror attachment for your rear HD camera. The total weight is only 10 ounces and features quick flip locks to easily snap your device into place at any moment. Being Bluetooth enabled it comes with rechargeable battery that lasts up to 300 hours on standby. Anker is another popular brand in Smartphone accessories category, and they’ve already some selfie sticks in the market for selling. This model is one of them, comes with Bluetooth connectivity, long battery life, and the premium aluminum alloy design. It’s easily fitted with most of the Bluetooth enabled iOS and Android models. Due to its hard aluminum-alloy frame, it’s lightweight and durable to support your phone from slipping or dropping. Packed with stylish and compact design making the selfie stick ideal for placing it in your bag or even in your pocket. In case you fold it quickly after using it and forget about switching off, there are no worries. It has an interesting shutter-release protection design which ensures that the button for releasing the shutter is covered by the phone cradle when the device is not in use. It can be stretched out up to 29 inches that’s enough to capture a perfect selfie or group photos during fun time. However, the Anker AK is a little bit pricey selfie stick compared to others, but with 18 months of warranty and many powerful quality features, it’s really worth if you think about personality and value a more premium feel in your products. BitzWolf is a convenient selfie stick with a combination of all modern features including durable design, Bluetooth remote, and a portable tripod. It’s something that you need to record your smile anytime, anywhere. With 33ft remote connectivity, it makes easy to use a tripod to memory your wonderful moments. Its stable tripod with non-slip foot pad can better assist your smartphone to capture great photographs every time. Along with that, its internal 65mAh rechargeable lithium battery can capture up to 50000 selfies after full charge within 30 – 45 minutes that’s outstanding. Also, the 360° rotation head and 270° rotation clamp allow you to capture the perfect shot from different angles. This selfie stick is widely compatible, easily fitted with iPhoneX, Samsung, Huawei, HTC, Xiaomi, LG, Sony, etc. Although, not compatible with Nexus 6 phone, Lumia 950xl, Meizu Pro6, xiaomi 5x. 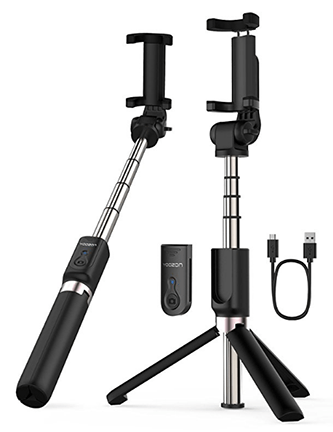 If you want a selfie stick with Bluetooth and a tripod at the same time, this model of BitzWolf could be a great choice after Yoozon selfie stick. 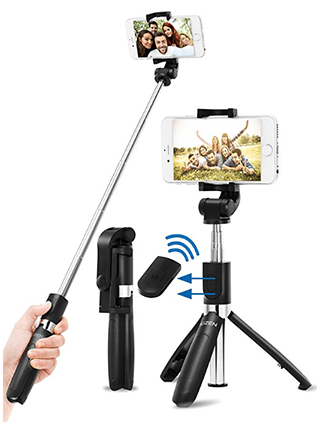 Another premium model is the Selfie World Bluetooth selfie stick, which offers amazing compatibility, reliable connections, and lower battery consumption. For wireless connection, it uses the new & advanced USA Bluetooth technology that provides zero shutter lag. The interesting feature of this stick is that it has a 3-sided mount which has been specially engineered to handle any smartphone with a maximum width of 3.5 inches. Can be used with all Apple and Android 4.3+ Smartphones without issues, as well as, also good to go with certain digital compact cameras and iPod Touch models. Besides that, it also comes with compact design, you can fold down it instantly and keep it in your pocket very easily, the folded length is only 7 inches. With up to 36 inches extended length and 270-degree rotation it gives you super wide angles for amazing selfies, close-ups, and even some creative video for your YouTube channel, you can definitely benefit from its abilities. If you’re looking for a great quality selfie stick look no further than this model from Selfie World. Because it comes with an affordable price tag and has all the features you could need in a reliable selfie stick for capturing the evergreen moments of yours. Kizen is our another cool pick that allows you to take selfie photography to the next level with it’s integrated Tripod and Bluetooth Remote Shutter. It’s also compact when folded and has a bag for storage. It’s easy to assemble the tripod ( just slide the top holder up, unfold the tripod legs, and secure them by rotating the bottom knob). 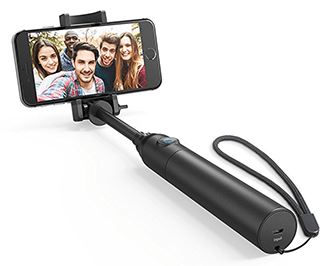 The telescoping stick makes it easy to get the camera up to about 30 inches away while taking your own selfie or group photos. The phone holder can be adjusted 270 degrees back-forth and 360 degrees from side to side, so you can get ultimate control of your photo angles! It’s also Lightweight, yet durable designs allow for it to be easily carried on you even on long trips. Along with that it also offers 18 Month Warranty so you can make your purchase with confidence! Spigen is our last pick which is Lightweight, compact and at just a tad under 8” when folded that enough to fit in your pocket. 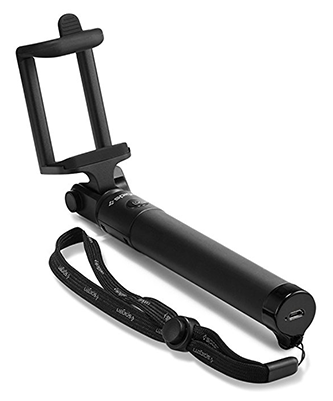 As well as, comes with Bluetooth and great Non-Slip Grip that helps you grab easily while capturing your moments. The stick can be expanded up to 31.5” inches and 270 degrees of viewable angles that well enough to capture a whole scenery for group photos. The Bluetooth capability takes less than 30 seconds to set up, and a shutter button down by the handle that allows easy picture snapping with the press of a thumb. 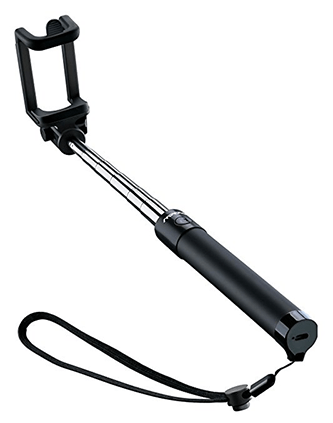 Overall, Spigen S520 is a great Bluetooth selfie stick monopod and could be a cool gift for someone you care about. So, these are the best Bluetooth selfie sticks so far that I’ve found. And, hopefully, this article will be helpful for you to determine your choice in picking the right one for yourself or as a gift for someone. Share your thought about the list above, if I mistaken any let me know throuh comments.